This is a raincoat that is super high quality in design and construction. This is a generous size and works almost like a poncho as the water runs off the coat. It is made of water and wind resistant nylon and lined with fleece. The fleece makes the raincoat stay in place on the dog as well as added warmth. The lining also gives the dog’s skin room to breath. The raincoat has under construction like a harness so when using the handle you are not pulling on the raincoat but are pulling on the attached harness straps that are on the inside of the raincoat. 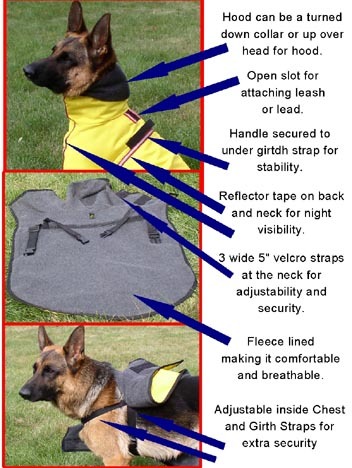 The hood can be worn up or rolled back down on the dog’s neck. There is reflective tape on the front and back of the raincoat for night safety. 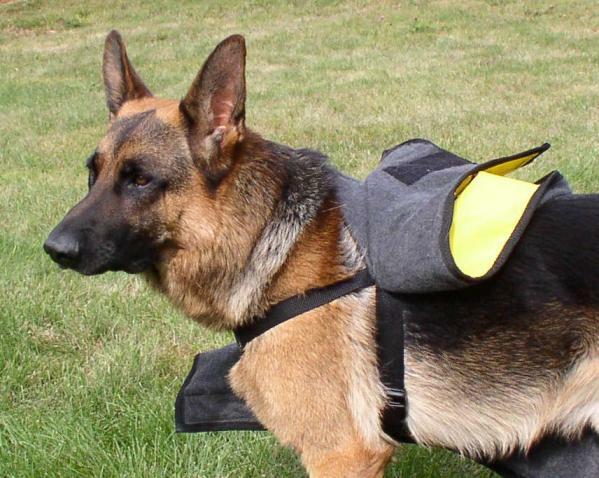 On the top of the raincoat there is an opening to attach your lead/leash to the dog’s collar. The neck of this coat has 3 wide Hook and Loop’s for secure closing of the raincoat. The inside chest and girth straps are both adjustable. The girth strap (over back, behind front legs, around chest) is adjustable from 32" to 37". 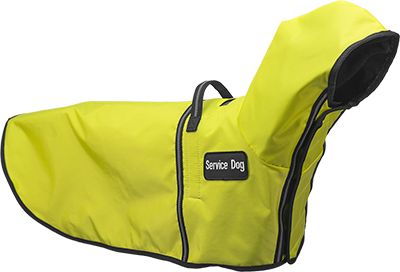 Our hard working dogs deserve this high quality and comfortable raincoat for their outdoor work. This raincoat is not stiff like plastic raincoats so it can also easily be worn as a jacket in cold weather. We attach the patch for you.